It was a very sad day when I learned of the passing of Vince Flynn. He lost his fight with cancer and I had his newest novel on my wish list for a very long time. I was heartened when I found out that there would be another Mitch Rapp novel! In The Survivor author Kyle Mills has Rapp and the CIA racing against time when one of their own betrays them. This may be the most severe threat to the Agency has ever had and the man behind it is dead. Rapp needs to not only stop the damage but he must also beat an unknown enemy to discover the source. His failure would have world-wide repercussions in the world and as always he was fighting enemies at home. I wasn’t sure what to expect from a Vince Flynn novel not written by Vince Flynn. 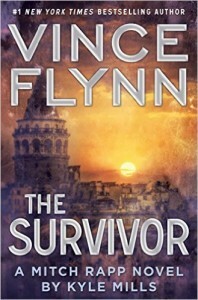 I had heard that Mr. Flynn was working on the next Rapp novel when he died, but I hadn’t heard how much he had completed. I naturally had to give it a shot. Mr. Mills picked up the “baton” and did a more than admirable job. There was a sequence in the middle of the book that had me sitting up with tension and I had to stay up way past my bedtime to finish the book last night. I paid for the lack of sleep, but a good novel is worth it and this was a good novel. It will be interesting to see if the series continues. This article was published on Oct 15, 2015 . It is tagged cia, kyle mills, mitch rapp, the survivor, vince flynn. You can follow any responses to this article through the comment RSS feed.